CHICAGO –Amber Clark, Sacramento Public Library’s North Natomas branch supervisor, was fatally wounded by a gunman in the library’s parking lot as she sat in her vehicle on the evening of Dec. 11. Since the time of this tragic event, the American Library Association (ALA) has contacted colleagues in Sacramento, California to offer resources and support. ALA President Loida Garcia-Febo released the following statement regarding ALA resources available to ALA members and how the library community can lend additional support. “ALA and members of the library community are shocked and saddened by the devastating loss of ALA member Amber Clark.” said Garcia-Febo. “I would like to extend my deepest condolences to Clark’s family, friends and colleagues. “I ask that the library community keep Amber in their thoughts and prayers and celebrate her selfless commitment to building a better Sacramento through education and lifelong learning. “Amber’s life was an example of courage and dedication. She exemplified the values of ALA and librarianship in her work and, prior to that, as a youth services librarian. She was known as a passionate champion for accessibility and inclusion, and her invaluable contributions to those she served will greatly be missed. “As we work to make sense of this tragic act of violence, ALA has contacted Sacramento Public Library to offer support and will continue to work with local library leaders as needed. “In times of duress we look to one another for support and courage. I ask that ALA members work to provide comfort to Clark’s family and share their condolences in care of Sacramento Public Library, C/O Rivkah Sass, Library Director, 828 I Street, Sacramento, CA, 95814. “You may wish to honor Amber and her family by supporting the work she felt so passionately about. 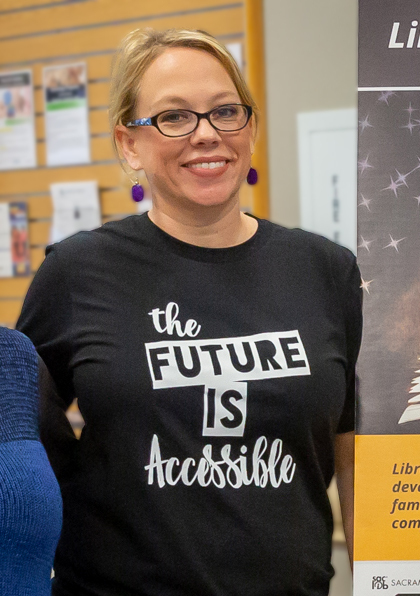 Amber was a fierce advocate for people with disabilities and helped Sacramento Public Library develop dynamic programs that made libraries more welcoming and inclusive. Your support at https://www.saclibrary.org/amber will help the library carry forward Amber’s legacy.